Way cuter than a python: the capybara is also known as "chiguire" in some Latin American countries. Such a creature is a capybara. Dr. Elizabeth Congdon, Department Chair of Natural Sciences at Bethune-Cookman University in Daytona Beach, is warning that the rodent (which looks like an oversized guinea pig) could be Florida's next invasive species. 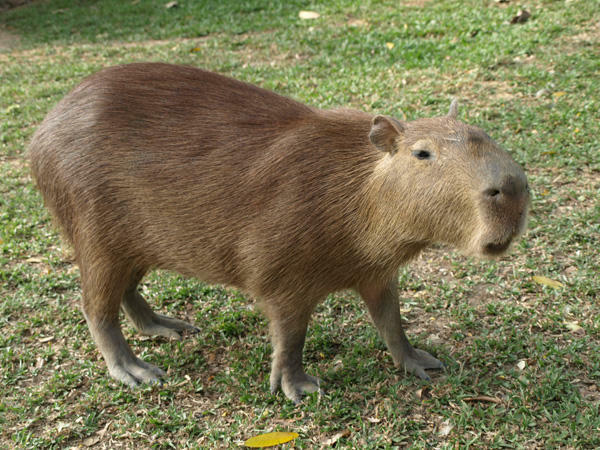 In the following interview, she tells WLRN's Christine DiMattei how the capybara came to Florida -- and what should be done to eliminate it as a pest without harming a species that some Americans are starting to keep as pets. What in the world is a capybara and how did it get to Florida? WLRN's Christine DiMattei interviews Dr. Elizabeth Congdon of Bethune-Cookman University in Daytona Beach. Still have questions about the capybaras? Here are some FAQs. The capybara is the largest rodent in the world. Native to South America, its closest relative is the guinea pig -- but capybaras can grow to about 4 feet long and around 100 pounds. How did they get to Florida? A few capybaras escaped from a research facility near Gainesville in the early 1990s. Most of them were recaptured but the ones that weren't have evidently been breeding; a number of juvenile capybaras have been spotted in north-central Florida. Are they invasive in Florida? Not yet. Until they become a problem, they're considered a non-native, "exotic" species, not an invasive one. What would make them invasive? If they breed to the point where they enter agricultural lands or spread disease to humans, capybaras will probably be classified an invasive species. In Brazil, they've been known to carry a tick that spreads spotted fever; also in that country, they're fond of eating crops like corn and sugar cane. What should you do if you spot one? Capybaras might look cute and cuddly, but animals lovers should resist the temptation to capture one from the wild and keep it as a pet (it's illegal to have a capybara as a pet in Florida without a permit). If you see one, you can contact the Florida Fish and Wildlife Conservation Commission's Exotic Species Hotline at 888-IVE-GOT1 (888- 483-4681).